Let the season of giving start early! They say that Christmas is the season of giving and loving. Why that doesn’t last all year round is beyond me, but we thought it would be very nice to actually live up to the season’s name and give away something. For free. I know they say there is no such thing as a free lunch, but there is a such thing as a free Articulate Skin! Paco Garcia Jaen, one of our developers and graphic artists (and talented writer of this post!) has art-directed this skin and Rob Hicklin has built it so you can use it as you see fit. The logo is also XML driven, which means you can add your own logo to the skin if you wish. In order to do that, just you have to change the provided image with another one, but leaving the name as it is at the moment. First of all download the Skin Package and extract it onto your hard drive. Inside the folder, there is a file that contains the skin package. 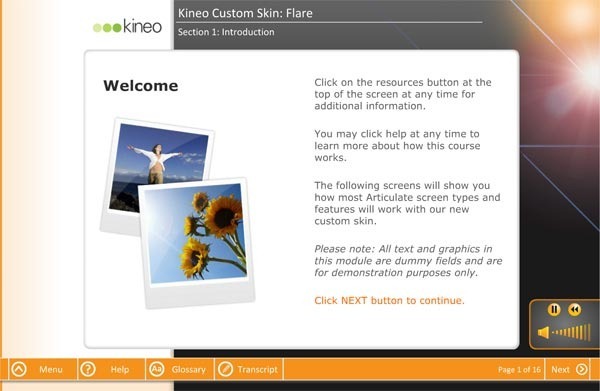 Double click on “kineo_skin_package_Flare.artpkg” to install it. Amend the logo sample and add your own logo. It is important the size remains unchanged, so don’t resize it. Also remember to keep the file name untouched. If you rename it as anything else, or change it into another format, it will not be seen by the skin. The XML file drives the image into the skin. So yu will need that file too. Create your Articulate e-Learning and publish it as normal, making sure you choose the skin as template. Once you’ve published it, drop the XML file and the logo file in the root folder where you published it. Enjoy your course with your new skin! It is with great pleasure that I present you, dear reader and Articulate user with this free skin for your enjoyment and pleasure. This rather bucolic skin has been art directed by Paco Garcia Jaen, and developed by one of our developers, Robert Hicklin. The skin features an illustrated landscape using wooden posts as navigation, menu, transcript and help buttons. To make it even more flexible, the development team created the skin so the logo is XML driven and customisable by simply changing the image supplied. First of all download the Skin Package and double click on it to install it. Download the logo sample and add your own logo. It is important the size remains unchanged, so don’t resize it. Also remember to keep the file name untouched. If you rename it as anything else, or change it into another format, it will not be seen by the skin. Download the XML file that drives the image into the skin.